Considering all the competition online, companies are working hard to improve their digital marketing strategies. If your company produces any type of video, be it a product demo, explainer video, or any other type of video content, then you’re in the right place. Markup makes your video content more discoverable and presents them in the Google search engine results in a more elaborate & detailed manner. Markup creates rich snippets that display creative search results with your video if you include the markup language correctly in your code. Many companies are still unaware of how to use schema in their code and as a result are lagging behind on reaping its benefits. 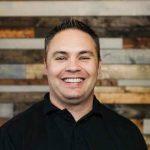 So in this guide, we’ll break down how you can reap benefits of using schema markup correctly. What is Schema Markup & Structured Data? Structured data is a markup language that helps search engines like Google understand your company’s website better. The information present on your website is organized as chunks of data, which is decoded by the search engines to interpret it. This is beneficial for a company’s listings and marketing. The important information highlighted includes name, place, products, videos, articles, etc. When something is searched on a mobile device or a laptop, the video markup implements a badge on the image of the search results and makes it more likely that your web visitors will click on your content. 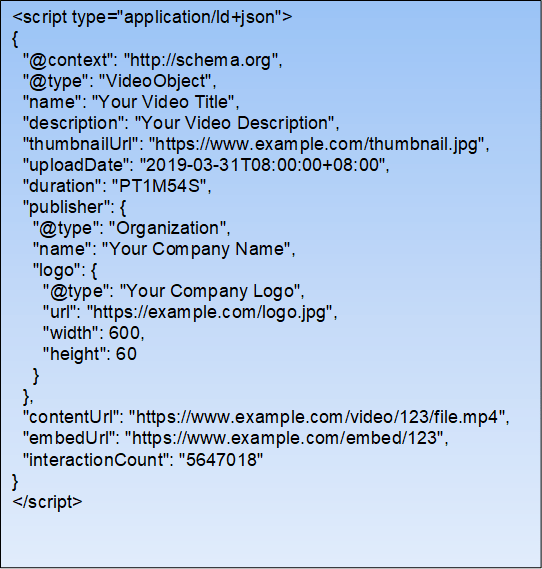 How is Video Schema Markup Useful for Your Site? 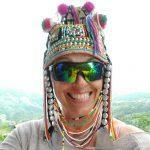 To enlighten you about its benefits, I would begin with visibility. But it’s extremely important to focus on creating your video schema correctly, which markup language helps you to do. Knowing a video’s name and description isn’t enough for growth; there is much more to it. You want to include information about the content of the video & video duration to get maximum results. Your script can be written in various languages, including Microformats, Microdata, JSON-LD, RDFa, etc. Microformats: It is a simple and basic form of structured data, which can help search engines understand very specific topics, like reviews or people. Microdata: It is based on HTML5 attributes, whose keywords refer to the schema vocabulary. RDFa: It is also very popular and greatly used because of its vast vocabulary, but that makes it more challenging to use for website owners. JSON-LD: This is the most popular as it’s the most simple language and easiest to read and write. Below is the general markup code provided by Google, including specific significant parameters that can be quite easily included in your own HTML code of your video page. This markup needs to go into your header section and its parameters can easily be edited with your information. Description: In text format, provide a brief video description. It should be unique and understandable. Name: The title of the video used. This should be rather short and catchy. Also, it should take care of the keywords usage, which is important for SEO. One image should be present on every page, which enables Google to select the best one out of them. This image appears as a Thumbnail image in the search results. The image URLs must be indexable and accessible to web crawlers. UploadDate: The date should be the one on which the video was published for the first time. ContentURL: The URL navigating to the actual video. EmbedURL: The URL navigating to a video player. Expires: The unavailability date of the video. InteractionCount: The number of views on the video. 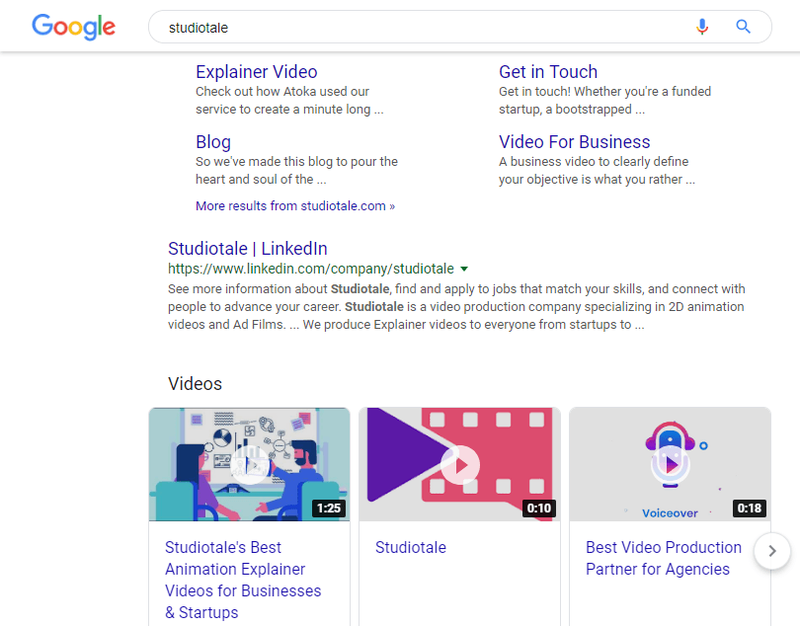 If you take time to optimize your video schema markup, you’ll find that your videos are indexed more in Google, as you’ve helped optimize the search results. The standard markup code created by Google is very handy, but it requires that you use it properly. Implementing schema markup correctly allows search engines to crawl relevant video content on your site. After adding the schema markup to your code, make sure that the configurations are set up and all accesses are in place. You’ll want to make sure that you’re using the appropriate keywords to target the type of audience you want. 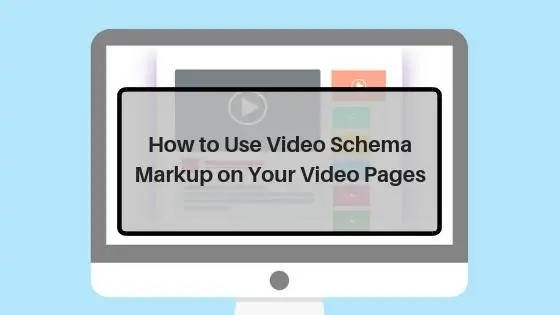 If you’re not using video schema markup, now’s the right time! It gives proper visibility of your video content in the serps (search engine results pages). It optimizes your videos, so visitors are more likely to click on your content. As you implement it, you’ll see the positive SEO results for your videos. 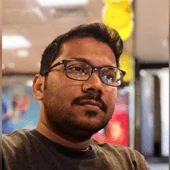 Koushik Marka is the founder and CEO of Studiotale, an explainer video production company. He is passionate about helping brands grow with video and has expertise in video marketing, 2D animation, and Vector Illustration. When he is not working, he loves playing video games and travelling.